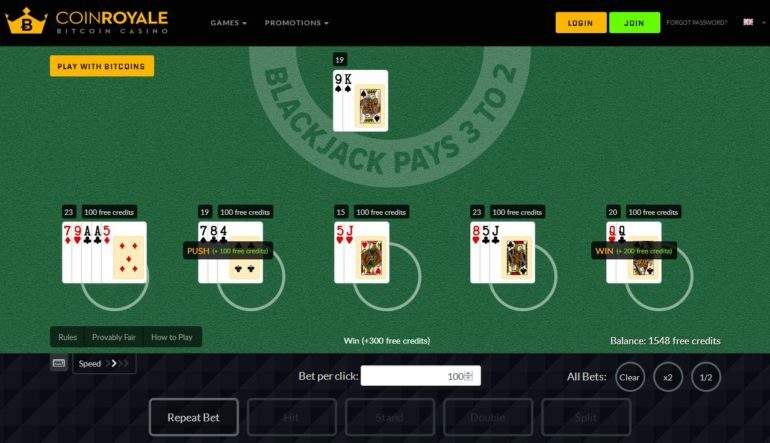 What I noticed first about Coinroyale.com is the fact that it did not have Poker tables like other online Casino’s have today. All they have are Video Poker games that look entirely the same! The video poker style they have really screams 90’s. Before you can start any game, please select a bet and click on “Deal” and wait for the prompt saying that you need to play for real money to disappear. Here are the games that I looked into for you. Bet – Maximum of 1 credit to a maximum of 2000 credits per game. To start the game you need to choose how much you want to bet. Once you have decided how much you want to bet from 1 to 2000, click on DEAL. This will signal the machine and deal five cards for you. At this point, you are able to only HOLD and DRAW cards. You are at any point unable to cancel a bet once you have clicked on DEAL. Paytable is posted on top of the cards. The game plays very similarly to Jacks or Better. Start the game by choosing your bet. You will then be dealt five cards by the machine; choose which cards you want to keep and discard then click on the draw. 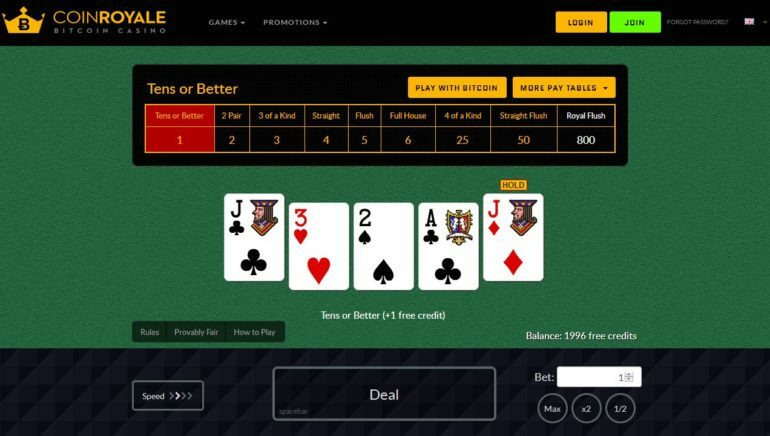 Basically, all Poker games offered in Coinroyale.com are just basically the same. You choose how much you want to gamble and click on “Deal”. They have video poker like Jacks or Better, Tens or Better, Bonus Poker, Double Bonus and of course, Double Double Bonus! You can, however, play different games offered on their website. A picture below shows their Black Jack table which looks nice compared to the Poker tables we had earlier. If you think that you are having a lucky day, why not try to play Dice? To start the Dice game all you need to do is choose your chance. You want to pick a number that you think you can predict well to make the most profit out of the game. 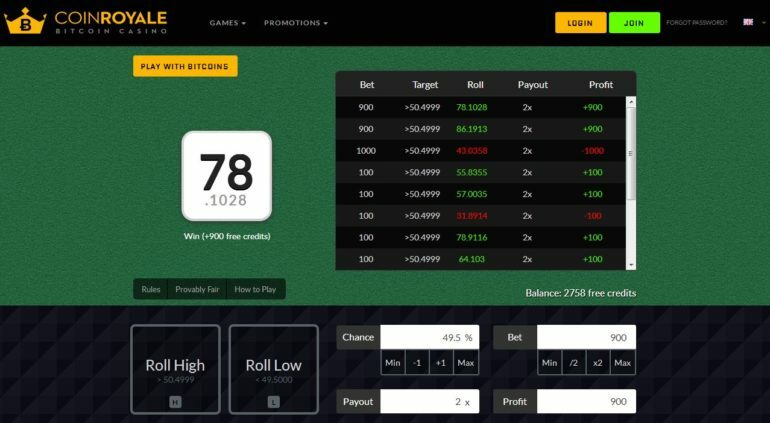 Once you have selected your Chance, you will see how much payout you can generate from the odds that you have picked. You can not choose “Roll High” or “Roll Low” to start rolling the dice. The games offered on Coinroyale.com is not “code heavy”, this means that the website needs less bandwidth to play properly in. There is a number of people out there today that would love to play in an online casino with little less fancy designs and everything like that. 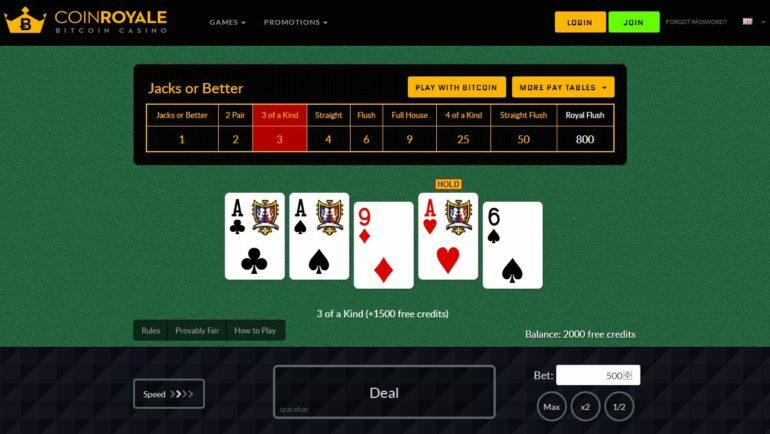 I personally like to play in websites that get’s you that feel of the real casino and not something that is clearly a computer game. This website is really for the “distinguished” taste.